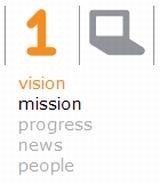 Another New OLPC Mission Statement?! To eliminate poverty and create world peace by providing education to the poorest and most remote children on the planet by making them more active in their own learning, through collaborative and creative activities, connected to the Internet, with their own laptop, as a human right and cost free to them. OLPC is not at heart a technology program and the XO is not a product in any conventional sense of the word. We are non-profit: constructionism is our goal; XO is our means of getting there. It is a very cool, even revolutionary machine, and we are very proud of it. But we would also be delighted if someone built something better, and at a lower price. I wonder, does Windows XO count as better? I just wanted to say that I'm very surprised that constructivism is so controversial. Where I grew up and went to school, it was right there in the curriculum. I'm not sure, but I think It might have originally meant that education was a human right. ...providing education TO yada yada, BY yada yada, AS a human right..
"the current OLPC mission, whichever one it is, was not the first mission espoused by One Laptop Per Child." The mission has been one and the same since the project began: to sell millions of the underpowered devices to people under the pretense of educating poor children. As I have been saying for 3 years, children, constructivism, poverty, digital gap, whatever, are just props. They have never meant crap to Negroponte. He only succeeded in fooling the retardo geek community stupidly bent on supporting any initiative with the potential (in their retarded fantasy world) to hurt Microsoft. People of average intelligence easily detected the scam, because it was pretty transparent. "He only succeeded in fooling the retardo geek community stupidly bent on supporting any initiative with the potential (in their retarded fantasy world) to hurt Microsoft. People of average intelligence easily detected the scam, because it was pretty transparent." Quality of your trolling is now improving. Too bad, everyone is too tired of you to notice. Now I got what was nagging me. "to the poorest and most remote children on the planet". When I was looking at some OLPC international pages in the laptop.org pages, it dawned on me. The friends of OLPC have been and are mostly here and only here, in the United States. Except a few, VERY few others, there is zilch interest elsewhere, at least not enough for someone to set up a wiki page for their country future OLPC work. Here you count them by thousands. In "the remotest" parts we have to try to convince people, with our love for the game as only argument, without the resources that M$ can show and loyalties that they can and will buy, and very disunited. Doesn't look good for our side. XOs would still sell here though. eBay already is steady under $300, when it was above $500 a couple months ago. Of course Microsoft has the right to put his OS on the OLPC. Doing it for a low price can help the children and can help Microsoft maintain it's market share. Still, can Microsoft maintain it's software and business model doing that? They put XP on the OLPC, not Vista. Are they hoping the OLPC will double it's hardware capacity every X year so they can start upgrading? Or will they have to switch to a new, modular, software model as I believe Gartner suggested? They can not keep selling and maintaining a 2001 OS I suppose. But that's their problem. From the viewpoint of education I don't think offering a Windows version to young students is a smart move. You don't want to lock the new users in a OS of one vendor. They will have lots of opportunity to know and learn (a version of) the Redmond OS later. If that OS is really so user friendly, that shouldn't be a problem. And as an employer you would prefer people who have experience with different OS'es and programs. That helps a lot in requiring insight and in separating the essential from the lay-out. The random choses on things like user interface of the developers from the essentials of the job a type of program can do. I professionally don't trust anyone in ICT who speaks of "Excel" meaning a spreadsheet or if he want to mention a word processor uses "Word". "Quality of your trolling is now improving. Too bad, everyone is too tired of you to notice." It's not so bad, teapot. Somebody is always watching. I'm happy as long as I have at least one groupie who follows every one of my moves and comments on everyone of my posts. You. As long as you keep hitting the blog every five minutes, desperate to read what I have to say, I'm a happy camper. Since I'm a nice guy, I let you know that you can take the weekend off. I'll be back posting on Monday. Go take a break, relax and enjoy the weather. Go. Irvin: If you troll a forum for days in the middle of a massive flamewar, and the only person paying attention is an old, bored programmer, in your parts of the Internet it's called "epic fail".
" . . . OLPC is a non-profit organization providing a means to an end—an end that sees children in even the most remote regions of the globe being given the opportunity to tap into their own potential, to be exposed to a whole world of ideas, and to contribute to a more productive and saner world community." Then they won't be able to do it with the XO in any of its guises, will they? If they live in any of the most remote --- or underprivileged --- regions of the globe, they won't have electricity, will they? So they won't be able to use anything much to drive their educational tools except fractions of a watt in solar power, will they? So, whatever thse tools may turn out to be, they won't be able to use Windows, never mind connect to the Internet, will they? So they won't include the XO, nor any other of its nice little competitors in the nice little cheap-laptop market, will they? So the Negroponte initiative which was, magnificently, the most imaginative and important philanthropic project ever proposed when you first announced it, Nicholas, has now become a piece of totally commercialised nonsense, hasn't it? Nicholas, I have a splendid idea. Why don't you talk to me? Or even, maybe, instruct a minion to talk to me? Because, with the backing of someone like yourself, I can actually do what you said you were setting out to do.